The only thing the NFLosphere is going to be talking about today is this, so you might as well go ahead and read it now. 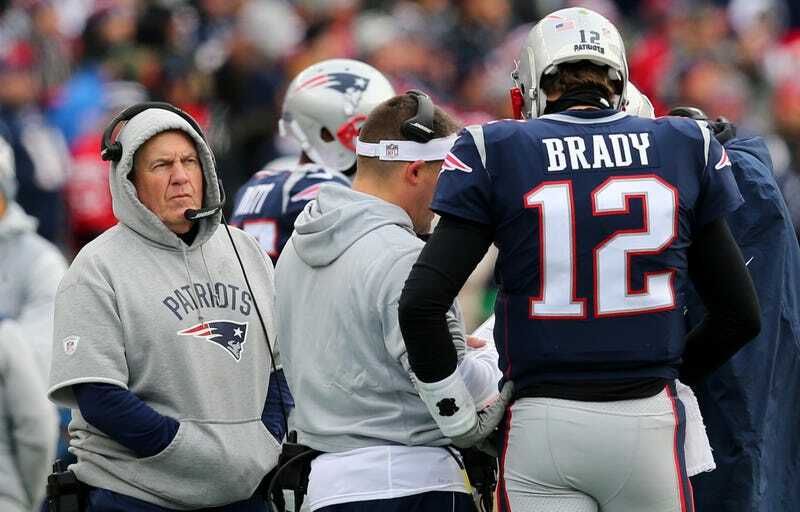 For ESPN, Seth Wickersham delves into the escalating drama at Patriot Place, and hints that the dysfunction between Tom Brady and Bill Belichick has reached the stage where it’s time to wonder if both will be around next year. Whether that’s a real possibility or not, the story is a fascinating chronicle of a clash between two furiously competitive, unprecedentedly successful personalities, with the egos to match. Brady and Guerrero’s training beliefs introduced an unspoken pressure in the building, with players wondering where they should work out. In August, receiver Julian Edelman blew out his knee, costing him the season, and there was “hypersensitivity” among players, in the words of a Patriots coach, over who would take his place. New players felt the surest way to earn Brady’s trust was to join Rob Gronkowski, Danny Amendola and others by seeking advice from Guerrero at his TB12 clinic — and not team doctors, which Belichick preferred. Guerrero says he wasn’t pressuring players to adopt his approach. Brady’s stature in the organization had grown to the point that he was considered management. New players often address him as “sir.” As Brady gained power, so did Guerrero, who became an even more divisive force in the building. One player visited TB12 under what he perceived as pressure, and declined to allow Guerrero to massage his injured legs. Instead he asked to keep treatment limited to only his arm, out of fear that one of Guerrero’s famous deep-force muscle treatments would set back his recovery. The Boston Sports Journal would report on another player who was told by Patriots trainers to do squats but later instructed by Guerrero to not do them. The Guerrero stuff has spilled into open conflict this season, with the trainer reportedly being banned from the sidelines and team flights and Brady getting snippy with reporters over the rift. [A]fter Garoppolo was knocked out of his second start because of a shoulder injury, he set up a visit at TB12. As he later told Patriots staffers, when he arrived, the door was locked. He knocked; nobody was there. He called TB12 trainers but nobody answered. He couldn’t believe it, Garoppolo told the staffers, and that night ended up visiting team trainers instead. Guerrero vehemently denies ever refusing to see any player, and Garoppolo was eventually treated at TB12 — but it was two weeks after he showed up for his original appointment, and only after a high-ranking Patriots staffer called TB12 to inquire why Garoppolo hadn’t been admitted. After Garoppolo rejected a contract extension offer—he didn’t want to be a backup into his 30s—his future had to be decided. In this story’s telling, Belichick never wanted to trade him. He saw Garoppolo as “the final piece of his legacy.” If you want to read between the lines, and not all that deeply, you could surmise that Belichick wanted to prove that his responsibility for the Patriots’ success isn’t beholden to Brady, and can outlast him. Two weeks before the trade deadline, ESPN reveals, Belichick and Robert Kraft held a meeting to discuss the team’s quarterback situation. The meeting ran long, very long. It resulted in Kraft firmly hitching his wagon to Brady, and not to what appears to have been Belichick’s preferred future for the franchise. The meeting ended with a clear mandate to Belichick: trade Garoppolo because he would not be in the team’s long-term plans, and then, once again, find the best quarterback in the draft and develop him. Belichick was furious and demoralized, according to friends. Belichick, having always subscribed to the philosophy that it’s time to go once an owner gets involved in football decisions, left the impression with some friends that the current dynamic was unsustainable. But this story still paints a picture of 40-year-old Tom Brady as deeply insecure and petty, even as he begins showing signs of his age. At the same time, as his age has increased, Brady has become an advocate of positive thinking. Belichick’s negativity and cynicism have gotten old, Brady has told other Patriots players and staff. He feels he has accomplished enough that he shouldn’t have to endure so much grief. Patriots staffers have noticed that, this year more than ever, he seems to volley between unwavering confidence and driving insecurity. Brady has noted to staff a few times this year that, no matter how many game-changing throws he makes, Belichick hasn’t awarded him Patriot of the Week all year. The Patriots, in an underwhelming rebuttal, offered a statement that claims ESPN’s story had “several inaccuracies” but declined to point out any. But even if everything in here is 100 percent accurate—and there’s no reason to think it’s not—the story is limited in what we should take from it, at least immediately. Any rift between Brady and Belichick has not affected the on-field play. Brady is a legit MVP candidate; the Patriots are 13-3 and are clearly the best team in the NFL; they are heavy favorites to win the Super Bowl. Every team wishes it had the Patriots’ problems. Going forward, who knows? The Brady-Belichick divorce is inevitable due to age, and maybe it’ll be accelerated due to ego. But that won’t play out for months or years. For the moment, this is just fantastically juicy gossip from a notoriously tight ship, and that’s plenty worthy on its own. Why Won&apos;t The FCC Let Orphan Counties Watch Their Local NFL Teams?